To follow up yesterday’s deposition from Pvt. John Bateman of His Majesty’s 52nd Regiment of Foot, here’s another guest-blogger essay from Richard C. Wiggin. Ephraim Flint “shouldered his musket” on April 19, 1775, “and as one of the results, captured a British Soldier at Lexington, and took him home with him, where he worked some time on the farm of his captor peacefully.” So we are told, at least, by Flint family lore. The origin of the lore is somewhat obscure, and whatever details might once have filled out the story have long since been lost. The story survives as a one-sentence teaser, repeated by a descendant in the 1904 printed record of the 150th Anniversary Celebration of the incorporation of Lincoln. Is it possible that there could be some truth to this story? And if so, where would one look to find corroborating evidence? There is a record of a British soldier in Lincoln four days later, on April 23, 1775. John Bateman, of the 52nd Regiment, was deposed in Lincoln as part of the Provincial campaign to document that the British Regulars fired unprovoked upon the locals. His is the only deposition (of twenty taken over three days) that was executed in Lincoln. Nor is it clear from Bateman’s deposition at what point he fell into the hands of the Provincials, or whether he may have been wounded. The content of the deposition ends with the firing on the Lexington Green, suggesting that he could have separated from the column before it reached Concord, or at least that he was probably not part of the patrol at the North Bridge. But this is speculative. All we know is that he was in Lincoln four days later. Can anything be deduced from the fact that Pvt. Bateman was deposed in Lincoln? Nine Lincoln men had traveled to Lexington to be deposed on the same day; another was deposed in Lexington two days later. Is there a reason he could not have gone (or been taken) to Lexington, as well? Why was it necessary for the deposers to travel to Lincoln? Could John Bateman be Ephraim Flint’s prisoner of war? That essay was adapted from Rick’s new book Embattled Farmers: Campaigns and Profiles of Revolutionary Soldiers from Lincoln, Massachusetts, 1775-1783, available at local bookstores and by mail from the Lincoln Historical Society. 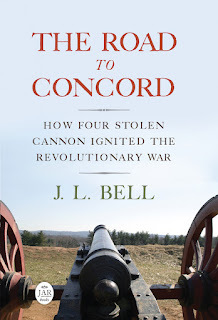 In his 1835 history of Concord, Lemuel Shattuck wrote that Bateman was one of eight wounded soldiers whom Dr. John Cuming cared for; according to other sources, that was at the house of Loyalist Daniel Bliss, who had gone into Boston. Among those soldiers, only Bateman “died and was buried on the hill” in Concord. If Bateman was indeed suffering from a fatal wound, that suggests this man could not have “worked some time” on Ephraim Flint’s farm. It would also explain why he didn’t travel to Lexington to meet with magistrates there. But Shattuck’s statement raises other questions. If Bateman was wounded, he presumably experienced parts of the battle beyond the skirmish at Lexington; did he have anything to say about those events? Why was Bateman in Lincoln four days after the battle instead of at Dr. Cuming’s improvised hospital in Concord? And finally there’s still the mystery of who was Ephraim Flint’s captive, if indeed there was one. The muster rolls of the 52nd Regiment indicate that John Bateman, grenadier, died on 21 April 1775. Thanks, Don! So according to official British army records, Bateman died two days before signing his deposition. No wonder Gage and his commanders were so skeptical! First visit. Found you off a Russian blog. I will be following you as I love Boston, and History.